The crisis has created mass social movements in diverse sectors. Migrants/refugees and people in solidarity are struggling against the imposition of harsher immigration laws, border controls and concentration camps. Women fight against conservative regimes and laws that attempt to dictate control of their bodies. Millions of workers have gone on strike and brought down governments. Students have organized to take power over their own education and their future. Antifascists in the streets of European cities challenge the presence and political action of fascist and racist groups. Several counter-information projects initiated by activists challenge the monopoly of mainstream media in news’ broadcasting. Beyond the strict borders of fortress European Union, the Arab Spring, the popular uprisings in Ukraine, Turkey and Bosnia and the events around the Mediterranean Sea suggest that the world has entered into a new era of conflicts and class struggle. Millions of people rise against oligarchic bourgeois or theocratic dictatorships, against police and bureaucratic violence, millions of people struggle to choose their own destiny and to eliminate nationalism. It is of great importance for radical mass social movements in the capitalist periphery to be able to coordinate their actions with revolutionary groups of the capitalist center. We are a diverse group of radical left, anarchist and autonomous activists who are organizing the conference “Connecting European Struggles”. We are currently working on a program which will host a number of participants from different European areas. 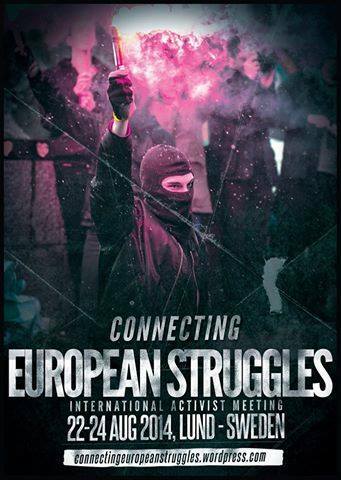 We invite everyone who shares the interest of connecting struggles across – and beyond – Europe to participate. We are interested in having both attendees but also participants with presentations to the conference concerning the following program points. We are primarily interested in struggles concerning migration, solidarity work, crisis, feminism, racism and (anti)fascism, exploitation of nature, workers’ struggles, student movements, counter-information media, activist journalism and so on. We will offer a wide range of program points from movie projections, lectures and talks, coordination meetings, soup kitchen, solidarity work and so on. We stand for housing for far-away attendants. Mark the dates in your calendar now!